SALT LAKE CITY — The arena was empty and the morning was awakening as Bingham took the floor at the Huntsman Center on Tuesday, and like a youngster before milk and cartoons, the Miners were zonked. “We’ve never played that early before. We woke up the same time we do for school, but we’ve never played that early,” explained Bingham guard Kyle Gearig. Before the Miners had an opportunity to rub their eyes open, they were clinging to a one-point lead at halftime against West in the 5A basketball tournament. The slow start provided the wake-up call they needed, and in the second half Bingham sleepwalked to a 73-42 win. Bingham outscored the Panthers 45-17 in the second half with the majority of the damage inflicted at the free-throw line (22-of-28). The Miners increased their efficiency from the floor from 30 percent to 59 in the second half while outrebounding West 21-12. “We knew that we could come back and not let them keep that up in the second half,” said Bingham sophomore Yoeli Childs, who provided a 10-point spark in the final two quarters after missing his first four attempts. 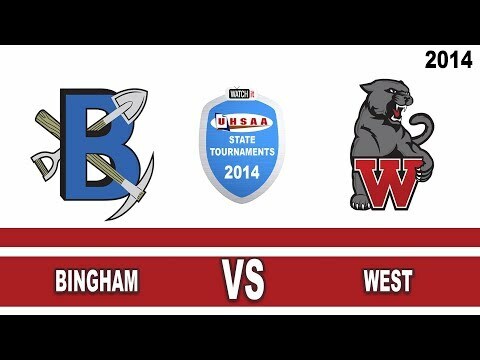 Each time Bingham appeared to gain separation in the first half, West answered with a 3-point play — one by Riley Kenner and the other by Dallyn Kenner. Eventually Kiley Kenner connected on wing with four seconds remaining in the half to pull his team within one, 27-26. “(Riley Kenner) had 13 points in the second quarter,” Gearig said. “So that was our main focus, shutting him down. I think we did that really well." The defensive adjustment left West searching for points while Bingham utilized Jordan Evans, who has experienced roller-coaster stretches after fracturing his hand earlier this season. He finished with 13 points, including a five-point burst with 30 seconds in the third to give Bingham a 49-33 advantage. The Miners will now face three-time defending champion Lone Peak on Thursday at 7:30 p.m. at the Huntsman Center.